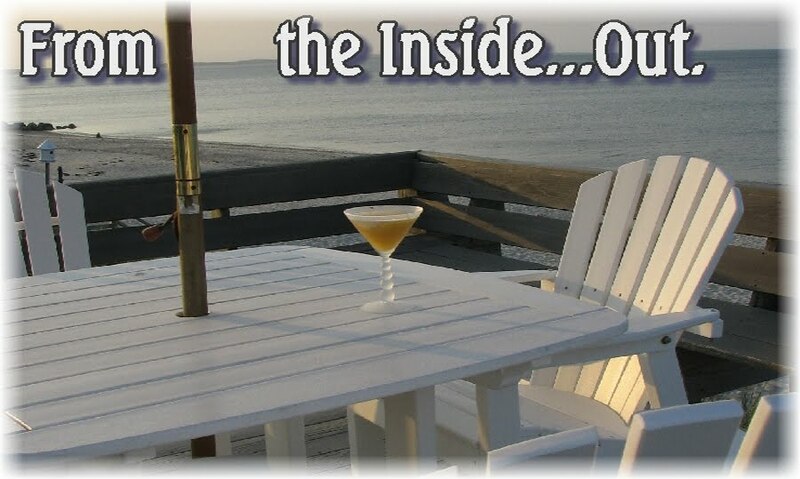 From the Inside...Out: Power On, Power Off. When I tried to silence it, I inadvertently hit the “last number redial”, which then dialed my dad. When I disconnected, he promptly called me back…because, like everyone else on the planet, he has Caller ID. This made me hit the “silence” button, because who wants to have a conversation with everyone listening whilst you’re on line at the bank? Hadn’t I been embarrassed enough? When I raced home...trying to beat da boys' buses, I realized that I hadn’t changed the time in my car. So, I’d been granted a whole entire hour. I decided to seize on this time to go back into my car to change the time on my dash….as I tend to drive off the road when attempting to change it whilst driving. When you only change the time twice a year, you tend to forget which buttons to press to make it happen. After changing the time I became so motivated, I thought I’d wash the interior windshield...which has had a layer of grime on it for…I’m thinking, maybe 6 months. Do not judge me. 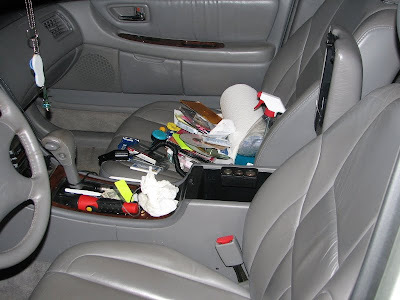 In my own defense, who remembers to bring the Windex and the paper towels back down into the car once you arrive home? I mean, it’s great in theory…but who has the time? Seriously. After cleaning the windshield, and the dash….and the console…I’d remembered one of those niggly little annoying things: I have an outlet in my console that’s supposed to be used for a cellphone charger. Only I’ve never been able to use it...‘cause for some reason, it doesn’t work. Now, I realize I have an outlet where the cigarette lighter would normally go (geez…I can’t believe people still use these things for cigarettes...), but my navigation has to stay plugged in there…as I’m slightly navigationally-challenged. As in I can’t find my way out of my own neighborhood-kinda challenged. 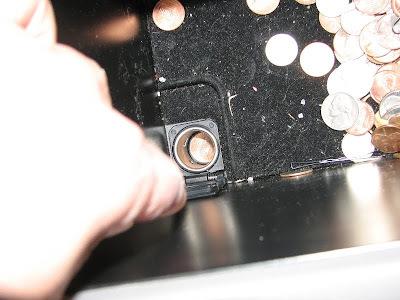 When I finally got to the bottom of the console, I realized I needed a flashlight to see inside the little spring-loaded trap door for the outlet. Do you want to see what I found? Yes, those are coins wedged tight into the opening of the outlet. Yes, I had been jamming those coins ever deeper into said opening each time I'd attempt to engage the cell charger whilst driving. Who the hell can see in there? It's dark....and full of crap. No, I've no idea how they got in there....the spring-loaded door should have kept the coins securely out of the way. Go figure. I had to hold the little door open with one hand. I needed another hand to hold the flashlight. I need another hand to hold the teeny, tiny screwdriver I had to use to try and un-wedge the coins from inside the opening…and I needed another hand to pick up the coins with a pair of tweezers once I’d flipped them onto their sides. When I got to the last coin (there were three), I saw a spark when my metal screwdriver came in contact with the bottom of the outlet. This reminded me that the power was ON. I then turned it OFF. Smiling smugly, I congratulated myself on not waiting till I was back at Toyota to mention this "malfunction" of the outlet…the guys would have had a good laugh at my expense. Now, ask me if the outlet works….go on…ask me. No, it does not. Why not? I’ve no idea why not. But, it kept you amused for 5 minutes, right? It took me over an hour. Who’s the schmuck now?! Wow. Who would have known that those pennies could wedge themselves in there? I'm still trying to figure out how to clean (and get the spare pennies out of) that space where the emergency brake is. At least you'll have a nice organised console now for a few days anyway plus a windscreen you can actually see through. Well done. Wonder why it doesn't work if there was a spark? Inquiring minds want to know! I probably would have torn the thing apart just to find out! That is a mystery how the coins got in there. Children perhaps? Oh I am so glad that it is only me that has these things happen. I second the did you turn the power back on and if you did - the fuse may very well be your prob! LOL! Kathryn you crack me UP! I'm glad you didn't get electrocuted. I haven't cleaned my car in months. Which is really gross because... well see above... I smoke! There is grime on all the windows. I try to clean the garbage out once a week or so but the windows are nasty. I have to say it: you're totally gifted! You make everyday seem like an adventure. Who knew that you trying to pry pennies out of the little tiny whole would be so thrilling? You have a super-power. Use it wisely! Except for your car is much, much, MUCH cleaner than mine. You are HILARIOUS! I'm so glad I found your blog. Thank you for making me smile...a lot! How'd youget a picture of the inside of MY car? Trust me, I too, have that much crap in my center compartment. The last time I cleaned it out I found 3 sets of keys (to what? Haven't a clue), 4 bottles of aspirin (various brands), a knife,a flashlight, a a bunch of expired coupons. Not to mention a whole packof gum melted to the bottom. Can you pass over those paper towels, please? You are so damn entertaining! OK, next time, try gum on a stick. You can solve numerous 'wedged in' issues with used (I know - yuck) gum on a stick - stick being any skinny item that will fit. I have a console challenge in my car where anything the size of a business card, a credit card, MY DRIVER'S LICENSE fits perfectly, and slips stealthily from this handy catch-all tray into an alternate universe. I'm actually considering bathroom caulk. Fun post. You often make me think... but you always make me roll on the floor! Haha...I'm sure I have some coins tucked into places in my car that I'd have a hard time fishing out. I'd probably just leave them where I found them though. XD I'm much to lazy to bother. I just peed in my pants! You are a very funny storyteller. You get lost in your own neighborhood? Good to know it's not only me! How horrible is that though? People will be like "you live between what and what?" and I sit there much like yourself-a schmuck! Glad you got the car cleaned, although it seems that you could have used that hour going to a car wash and spending $10 and having someone else do it for you and then had another 50 min. to get home and do whatever you please. Why do we make things so much harder for ourselves than we need to at times? um you blew the fuse when you shorted out the plug with your teeny screwdriver. The toyota guys are gonna totally know too. lol go to a service station and in your most helpless voice ask the 20 something attendant to check your fuse. He will prolly replace it free, or think youre totally hitting on him. Either way it will be fixed right? OMgosh! You crack me up!!! It's 1pm and I'll probably get fired for still sitting here and commenting on your blog, but it would be so worth it. Except then I would have to come live with you as I would be homeless...so perhaps I'll just say great post and get back to the salt mines! Phones are evil! I keep telling everyone but they never listen to me. At my house it could cost your life to race to any other place in the house so no one's running to answer a ringing phone. That's the answering machine's job! Cell phones are even worse! It means that "THEY" can call you anywhere at anytime!! I'm so out of touch that my phone is just one step up from having an antennae that you need to pull up! LOL Seriously. I make the occasional call on it. That's all. Email? Texting? HAHAHA! Why is it that something won't work in the car while out and about, but as soon as you bring it to the service station and tell the guy what's wrong, it works perfectly without his even touching a thing. Immaculate Correction, for sure. Sounds like a typical MeanDonnaJean Moment to ME! But Lord, this story IS priceless. Now, can I tell ya a secret? The last AUTOMOBILE I drove was a 1979 or so......and thankfully, way back then, they just didn't have all those electrical doodads and all those silly lil' compartments 'n contraptions to irritate the crap outta ya. On another note...you're supposed to clean the INSIDE of the windshield too?!? Are you for hire to clean my vehicle out? I had one of those embarrassing moments in the store the other day. Apparently my husband was playing with the ring tones on my phone and changed one(that I've found so far) to the chicken dance song. So my email wasn't read outloud, but everyone in line around me certainly was giving me the eye and laughing to themselves. Don't worry, I'm sure I'll never be able to fix a car in any way shape or form either. It's just like when you arrive late at the supermarket just before the holidays, Everyone before me has taken everything I was going to use, which leaves me floundering about desperately grabbing at leftovers. All I can see is a can of Brown Ale (which no one in the world drinks, unless they have drunk themselves unconscious and someone has tipped it down their throat in an attempt to drink them into sobriety). some strange looking tinned vegetable thing that not even the people who are unconscious through alcohol would touch. “I’ve left your rent in my bank and I’m going home to mothers and you know how much I hate my mother …..!! Storms out dramatically, which would have been a lot more impressive if I had not tripped over that dammed Yo-Yo and ended up face first in a bowl of not so lucky Charms…. Tinkerschnitzel: Oh, forget it! That's my version of The Bermuda Triangle. Or Vegas....what happens there...stays there! ValleyWriter: HA! Yes, I turned the key back on...it did NOTHING. But it would be like me to forget to try that! HA...I'm glad I'm not the only one who tried this app! Didn't really think it through! Lou: Thank you. Yes, now I can finally see. Those westward drives at sunset were KILLING me. Erin@TheLocalsLoveIt: AH! A FUSE?! Is that what I need??? smileyfreak: Thanks...yes, the rest of the day went along swimmingly! 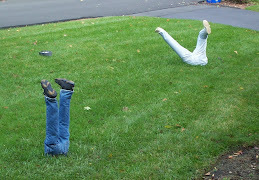 Heather: Nope...I doubt da boys had anything to do w/those coins getting in there...but BOY, they were wedged in tight! I've no idea why it doesn't work...definitely a spark. I guess I'll have to wait for the Toyota guys to look at it. MJ: Okay! I'll definitely have to look into this fuse-thing. Problem is, if it took me 6 months to check the plug, how long do you think it'll be till I get back to it?? book*addict: Thank you, sweetie! Yes, I have heard this before, although it's usually something like, "How did you manage to make an entire post about that??" carissajaded: See? So, you know EXACTLY what I'm talkin' about! It's a stupid thing...but it's annoying as hell. I want it to WORK. fullohope: Oh, you are SO WELCOME! I'm glad you're here....welcome to DA MADNESS! Sara: HA! So you're a believer in that old adage, eh? So for the next 6 months or so, your clock will be correct! Insanity: Well, that's why it took me 6 months to get to it...I feel the same way. Now, it'll be another 6 mos before I get back to it again. You're not the only one who's lazy, sweetie! Loredana: HA! I'm glad I'm not the only one who's "directionally-challenged"! Hey, the carwash place wouldn't have been able to diagnose my "plug problem"...and then I wudn't have had a story to tell! thatgirl: Ha! I'm glad I'm not the ONLY one....welcome to my world...stay with me, please! Alicia: HA! You're welcome to stay here...I could use the help...if you don't mind the temporary insanity, that is! Wendy Blum: Okay! Just give me 6 months lead-time...'cause that's how long it took me to get to mine. Oh, sure...except for those hamburger wrappers under both the seats, right??! Clandestiny: Oh! You are not a fan of the cellular telephone industry?? You don't want people reaching you anywhere...anytime?? But...what if I need to REACH you?? Gingerella: HA! Yup....there's this horrible film that comes from under the hood, I guess. I don't smoke, but it's still there. I only know 'cause I wipe my finger across the windshield and I can SEE! B-ster: HA! Your hubby sounds like quite the character! I say we return the gesture...what do you think?? You distract him! Oddyoddyo13: Well then...we're both gonna need alternative cellphone chargers! Just make sure you've got a map handy...just in case. I love the fact that you can make me laugh out loud! Thank you! The inside of my windshield also needs cleaned ... desperately! But I never remember until I'm driving into the sun and can't see a damn thing. So I temporarily squeak out a small area with the Wendy's or Dairy Queen napkins I have hidden in my console. Wendy Blum: Oh, you are too funny! I really threw you w/that word "niggly", huh? That entitlement for that photo is hilarious! Kimberly: Oh, I can SO relate! I have about 50 of these individually wrapped eyeglass wipes...they're each about 3"X3". I've tried using those to wipe away a circle to see through! I'm glad to know you feel my pain! Thanks for the laugh! THAT'S WHAT IT FEELS LIKE TO BE TRAPPED IN A BATHROOM! Did you turn the power back on? And where the heck was Clinton when all this was happening? He has two hands right? I guess that's why they call them inner voices... dang. Thanks for the laugh, it was much needed. Greetings you wild and crazy woman, you! Ok...when I got to the part where you mentioned the "screwdriver" I'm thinking to myself, "She's not, is she???" OMG...I'm suprised you didn't end up getting a PERM!?!? Honestly? I think your car looks pretty darn clean. I mean outside of the stuff you show us from the console, the rest of the car looks like new. And listen, I'm a smoker and even "I" never used those cigarette lighters in my car. I honestly think the only reason their in cars nowadays is to use as a recharger. Don't you just love the time change? I know we end up gaining an hour, but for some reason it always makes me feel like I lost an hour - I feel tired for days afterward. Anyway, tootsie...thanks for sharing your madcap day! And be careful with those screwdrivers. That is unless your drinking them. 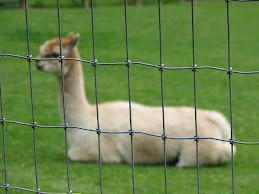 Very funny post! I never change the clock in my car because I can never remember how to do it and well I'm really bad about punctuality anyway. Hilarious as ever - I am totally with you on the not cleaning the inside of my car. I know I should. Hubby's is like a shining example and constantly makes me feel guilty. Btw. in the UK you can get these nifty adaptors for the cigarette lighter, so you can plug in more than one thing. I need to get me one of those so I can plug the satnav and my ipod in at the same time! Pennies always find themselves where nothing else would ever go. Good thing it was only a little spark you got before turning it off to retrieve the last penny. Those consoles really are much bigger than they look. I haven't opened mine in awhile, so I have no idea what is waiting for me in there! Oh, I love to read posts about things that I would absolutely also do and then flagellate myself for....You're the best. Lauren: HA! You and that bathroom stall door...AGAIN?! Yeah, were WAS Clinton? That's the biggest prob with someone living in your head...great for conversation, not so much for offering a hand! Ron! HA! A PERM! I love it!! It would have served me RIGHT! I totally agree w/you about the time change...now I'm noticing the sun disappears behind the clouds about 3pm and it's all downhill from there. 5pm feels like 7pm...and so on. And Ron? You're a freakin' genius with that screwdriver joke! I'd MUCH RATHER be drinking 'em! Spot: Don't you be calling my friend Spot an idiot! I used to clarify the "IV" for the longest time (Clinton's been with me since my very first post), but then it got old. I even used to link back on the word, but as usual, I got lazy. Don't feel bad...I don't know the name of YOUR IV, either! Have we been introduced?? Heather: Oh, I only wish! Nothing to apologize for, honey! He may as well be standing next to me...he's the loudest voice in my head and my very best source for witty conversation...don't you agree? Runnergirl: Wow...really? Maybe I should check out the auto parts store. Of course, if I spend the green on the adapter and then come to discover that for $2 I could have just changed the fuse, I'll feel stupid. Er....stupid-er. Collette: HA! Let's just hope that there's nothing alive in yours...all the power bars I'd had in mine could have meant mice and THAT would have been a whole different story! Maureen@IslandRoar: Thank you. I'm 'every woman"?? I think I am....I'm just a little more...vocal and public about it! I can only say this because I had one such day yesterday and probably should have spent the day in bed with the covers over my head pouting till this morning. At least I can laugh about it now and may just post about it....hmmm maybe not its still pretty irritating to me. Ignore my above comment then! saku chan: Hey, there's nothing wrong with a closet like that! Yours sounds like mine...trust me! It's only my CAR that got cleaned out!